Distraction-free writing apps are becoming increasingly popular and the appeal is easy to see, if you just want to write, why do you need to be surrounded by a gazillion buttons and toolbars? 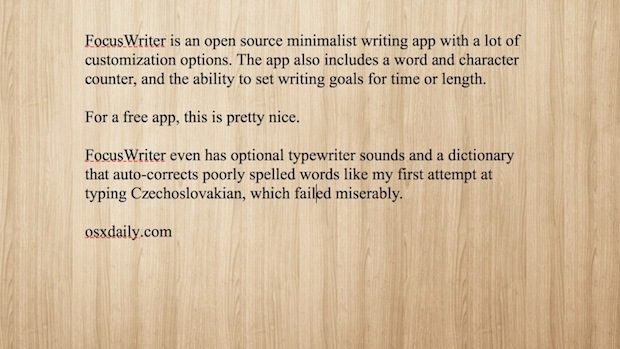 These apps are fairly simple and there’s a slew of choices, many charge unreasonably high prices on the app store, but that’s why FocusWriter is so great – it’s a quality distraction-free writing app and it’s completely free (and open source). The appearance is highly customizable so you can set whatever font and background works best for you, do this by dropping from the “Settings” menu and selecting “Themes”. Outside of the eyecandy, there are also a variety of genuinely useful writing features, and it’ll keep track of word count, page count, paragraph count, character count, as well as the ability to set writing goals either by time or by words written. 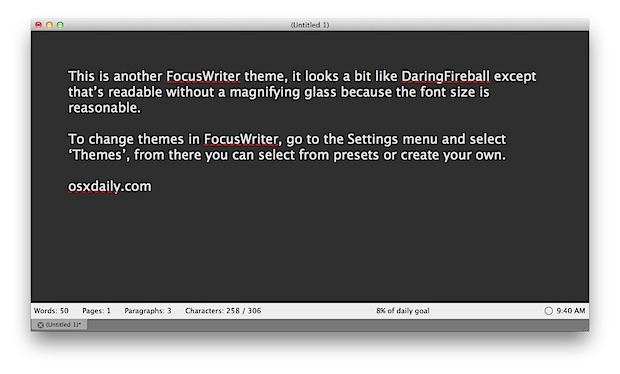 You see all these details by hovering over the bottom of the FocusWriter screen (see screenshot below), so they’re not always visible or in your way. Really the worst thing about FocusWriter is it’s ugly icon, but if that’s your only complaint about an app then you’ve got it pretty good. 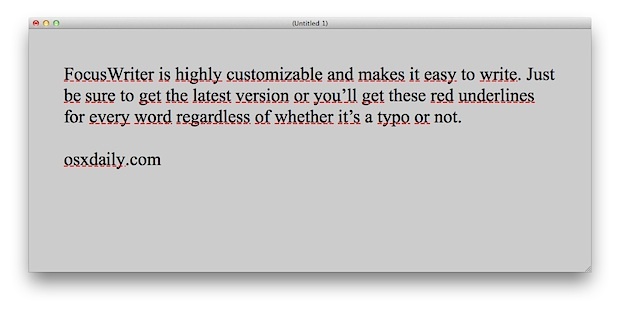 The app is cross-platform compatible, so you can run it in Mac OS X, Windows, or Linux. 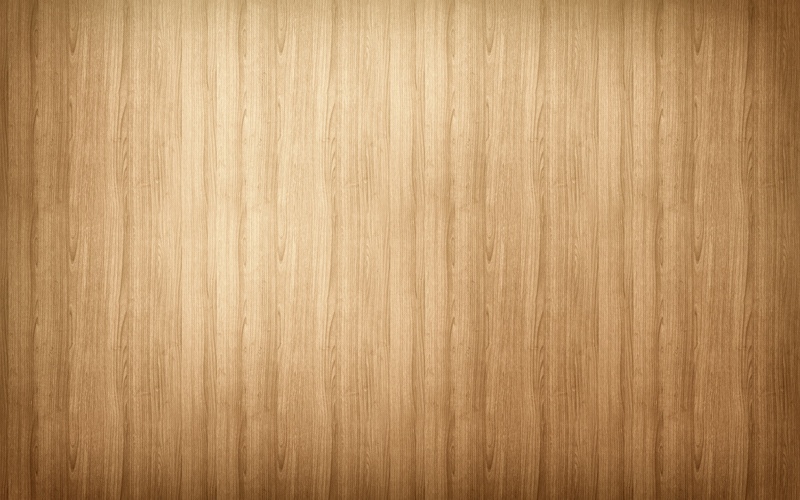 Sidenote: For those that are interested, the top screenshot is using a slightly modified version of the wood floors wallpaper (JPG) that I also use as my custom Dashboard background image. The bottom two images are default themes. LOL @ the Daringfireball reference, I have to hit Command+PLUS about 5 times on my MacBook Air to be able to read that site without squinting. Thanks for the app, looks good. +1 on the Daring Fireball reference. Another thing that makes them hard to read is their grey background. They seem to have managed to find the exact shade that provides the most eye strain due to weird contrast. btw: There is no Czechoslovakian language, just Czech language and Slovak language. There was Czechoslovakia (1993 split into Czech Republic/Slovakia), but there was never common language. I prefer to write on my tablet and on Android there is only one good solution – dType. Others are paid or too clunky on the interface. dType is actually an outstanding little app.